In 2016, two astronauts finished nearly a year of work on the International Space Station. NASA's Scott Kelly and Russia's Mikhail Kornienko were studied closely for changes in their physical and psychological health. NASA touts the mission as part of its "Journey to Mars", in which it hopes to send humans to the Red Planet by the 2030s. But a recent paper published in the journal Space Policy argues that there are so many aspects to a Martian colony that it is all but impossible to simulate the parameters on Earth. 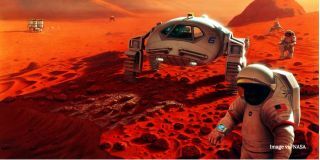 "We can not simulate the same physical and environmental conditions to reconstruct the Martian environment, I mean such traits like Martian microgravitation or radiation exposure," Konrad Szocik, a cognitive scientist at the University of Information Technology and Management in Rzeszow, Poland and lead author of the paper, said in an e-mail. "Consequently, we cannot predict physical and biological effects of humans living on Mars." He argues that "an awareness of the one-way journey and all possible dangers" cannot be simulated on the ISS, or even in Antarctica, one of the most remote places on Earth and a frequently cited zone in space analog studies. Szocik argues that people in Antarctica are not reliant on artificial life support to the degree that astronauts are. Szocik suggest individuals acclimatized to living in harsh conditions would be best suited for exploration of Mars. So that's not to say that the space station or Antarctica wouldn't be useful locations for training. But, he argues, it may be necessary to go a step further — modify people's bodies and minds ahead of journeying to Mars. He suggests possibly electronically enhancing the human senses or prescribing medication that might help diminish emotional reactions in a moment a crisis. Of course, how exactly to do this still lies mostly in science fiction. Szocik says he is greatly concerned with how a Martian colony would function. While most discussions of colonies focus on the technological or financial challenges of constructing and maintaining it, there has been less study of the social aspects of putting people within a Martian colony. "A human being is a social animal and he lives in a group," he said. "Group problems affect many challenges and troubles, and we should consider now how we can prevent such typical human problems like conflicts, wars, cheating, etc." Szocik is also concerned about reproduction on Mars, which not only needs a technological and medical support system, but a large enough colony to avoid the risk of inbreeding. He suggests a population of at least 500 adults on the surface. Not only that, but medical officials would should consider how to reduce the likely mortality rate from disease, possible technological failures, and radiation from the Martian environment, among other factors, he said. Szocik's previously written about how religion would function on Mars and how the human psyche might be impacted. first foray into predicting human behavior on Mars.